Beautiful images over at Lyndie Dourthe melts away any language barrier. Want to give something special for Valentines Day? Who could resist a restored 1950's ROYAL cherry red typewriter. Check out the cool collection at Three Potato Four. 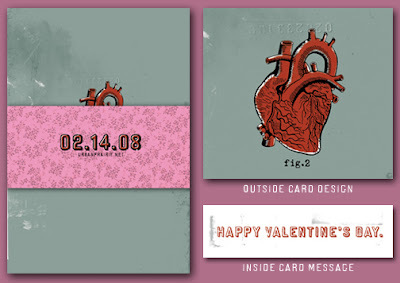 For a vintage twist, type your "I Love You" messages inside your valentine cards. I'll give everyone one guess to why I am immediately drawn to the work of Liz Grotyohann. Liz's company is called Pica Pica (Black-billed magpie, latin name. (See also magpie: Someone who collects things cast off by others). 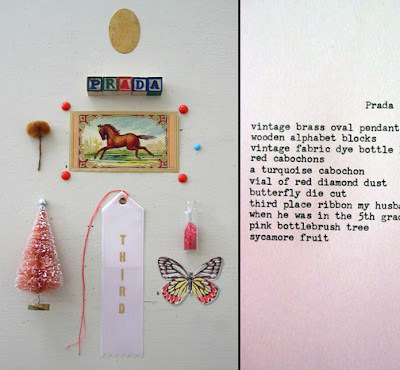 Liz's collage and found object art has been called "dark, wicked and evocative." 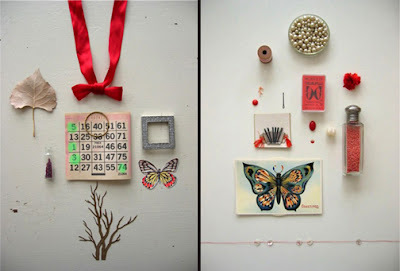 She assembles scraps of paper, wood and cast off objects into dark vignettes often dealing with difficult issues. 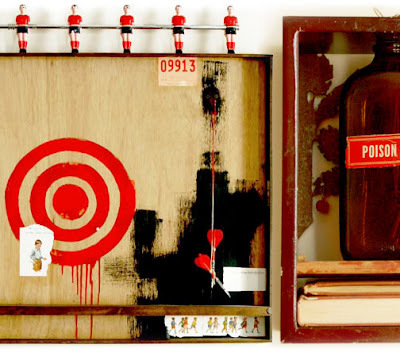 Frequently, she uses iconic symbols of childhood recontextualized to portray a loss of innocence. 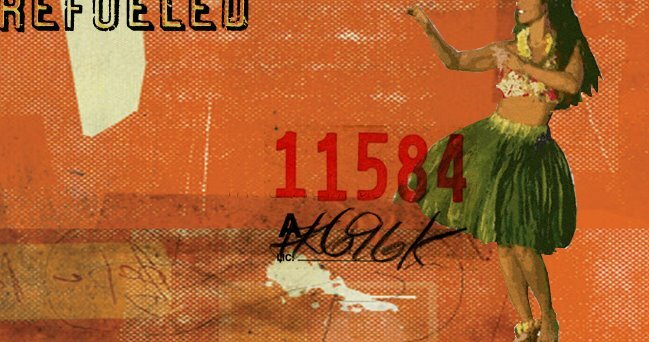 Her works are sometimes deliberately ambiguous, leaving it to the viewer to decide what level of message to take from the piece. Cool little arrangements by lush bella. I instantly dug these as I have a small new book in the works called "Assemblage" which showcases bits and ends from my many odd collections. Chris Brown: Howdy Amy! The last time we were together, David, you and I were acting crazy in Houston’s Four Seasons Hotel. That was during the International Quilt Show. How did that go? Amy Butler: Hey Chris! We were a little nutty! That was a blast, it was such a joy meeting you in person! Amy: I had a phenomenal show. 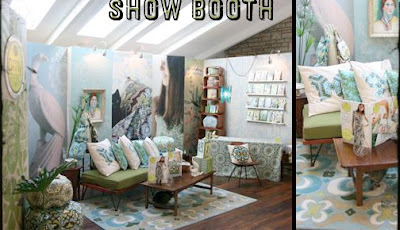 My new patterns and book were well received and we had the booth decked out, looking like our family room from home. The booth had a great vibe, and I think folks enjoyed it. The show is so much fun, yes it's about doin' business but my favorite part about the show is meeting up with my retailers and making new friends. The overall attendance was at an all time high which is super cool for everyone exhibiting. Here are a couple shots of the booth during pre set- up in our living room! We design and completely set the booth up at home so we can make improvements and tweak it right before we pack it up to drive it to the show. The cats love it! Notice Mr. Pete hiding under the coffee table. I wish we could take the cats to the show, they'd enjoy all the attention. Chris: As you know I’m celebrating the one year anniversary of this blog REFUELED. 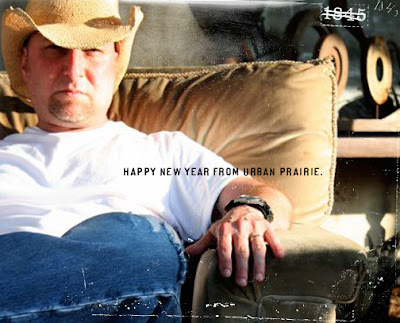 You and Dave have been huge supporter of Urban Prairie over the years and for that I thank you both. 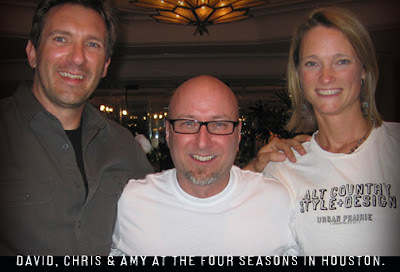 Amy: BIG CONGRATULATIONS CHRIS! That's fantastic! I bet you can't believe a year has gone by already. We are so happy for you. Dave and I LOVE Urban Prairie, you have such a fresh and luscious perspective on life and design. Thank you for your beautiful contributions and unique outlook. Chris: There was a quote recently from a design blog that read "Alongside people like Amy Butler, Chris is giving new definition to American West country style, updating it with a hip modern sensibility, and yet maintaining a strong retro feel." With Urban Prairie I’m trying to get people to take a different look at odd, edgy and vintage objects and how they can incorporate them into a modern setting. What do you want to convey with your “Midwest Modern” style? Amy: First of all, I'm completely flattered to be in your good company and what a lovely quote! 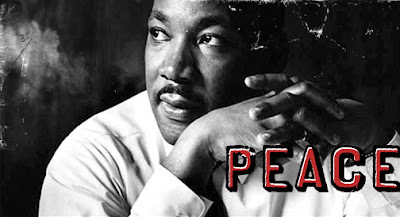 are great examples of inspirado! 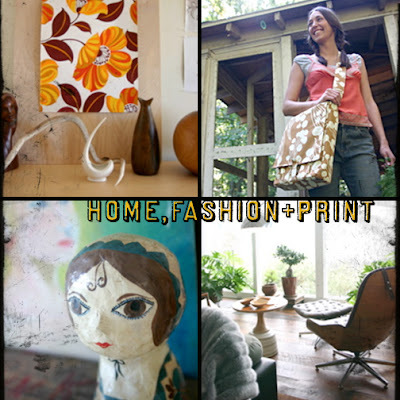 A mix of home, fashion and print. Chris: And speaking of “Midwest Modern” (Stewart, Tabori & Chang), your new book of the same name is packed full of your beautiful work and examples of the simple ,stylish life your share with Dave. Can you tell us a little about producing it and what it was like working so close with your husband, who took the photos? Amy: I'm so happy you are enjoying my book! When Dave and I first opened our advance copy we were overwhelmed with emotion because it's such a personal, passionate expression from us. To see everything come together the way we envisioned is so satisfying. It truly is " hand made " in every sense of the word. We loved the whole process of creating this book because of the flexibility that we built in by doing the photography ourselves and having Dave design every spread. We were able to take our time with producing the content and truly capture things spontaneously and naturally. We did " plan " a great deal of the photo shoots in order to have a schedule established that kept us on track, but we had several occasions for example where I'd grab Dave after dinner and have him shoot the garden, or a specific flower in bloom because the lighting was just right! He'll say " Mamma Crazy " and tease me, but he totally understands. We both enjoyed being able to put tons of thought and personal touches in the book, we wanted to give folks our all in every way, the whole process was very creative and fulfilling. We love working on projects like this together, we each have our specialties and we honor that, but we both can be pretty stubborn so compromise is important! After 22 years together, we've worked out the " kinks " and we completely enjoy and appreciate each other. I'm one lucky lady! Here are a few " spontaneous" garden shots. We're always snapping and recording the various plants, capturing them in their glory. I keep loads of visual journals with images from the garden for print and color inspiration. Chris: Your company Amy Butler Design really expanded in 2007. What do you have in store for the new year. Amy: Fabric, fabric, fabric! I'm having a ball over here! I have 3 major lines releasing over the next few months. Two new quilting collections and a new home dec collection this spring, including " Amy Butler Solids ".
" Midwest Modern " is my brand new quilting group that will be in stores this April. The line is inspired by the vintage modern spirit of my book . With luscious palettes called Ohio Sky and Pink and Orange Dahlias, the colors come from beautiful summer days in my garden. I worked on my artwork during the peak months last summer when everything was in full bloom and superlative. My color story for my tropical and annual flowers was hot pink and orange. There was no escaping these gorgeous color combos! I had to include them in the line. The print mix is organic and perfect for fashion, quilting and home dec projects. 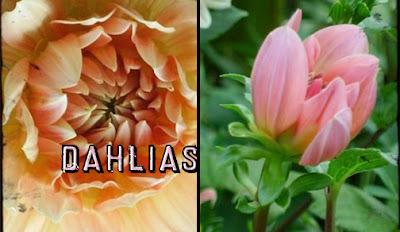 Here are a couple shots of my favorite dahlias from the garden. Amy: And here is a sneak peak of " Midwest Modern "! Amy: I also have several new patterns and books in the works and a lovely new line of stationery and scrapbook papers releasing in the summer. I'm currently scheming to add some new pillows to my web store and some other fun new products. I'll keep you posted on that one! Chris: You know I’m a huge collector. You and Dave collect as well. 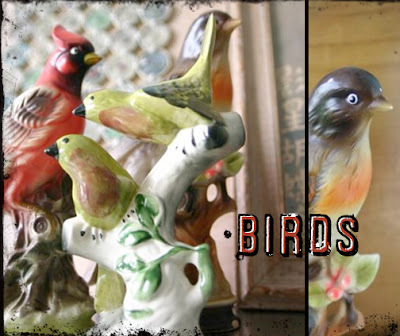 He has his vintage bikes and skateboards and lately you seem to be collecting vintage McCoy pottery and bird figurines. What draws you to the things you collect? 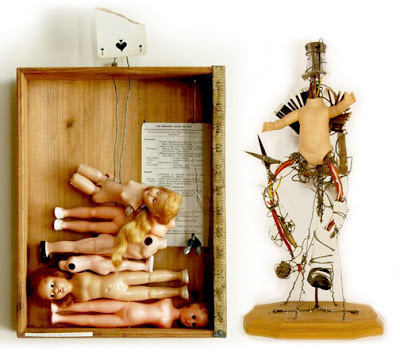 Amy: Our collections tend to evolve from our passions for our surroundings. We are huge nature lovers and our home provides us with some incredible views of the valley below us. We spend many an hour bird watching from our picture windows in the family room which explains the draw for bird figurines. They are beautiful and elegant with rich colors and textures that feel completely at home and alive in our living spaces. 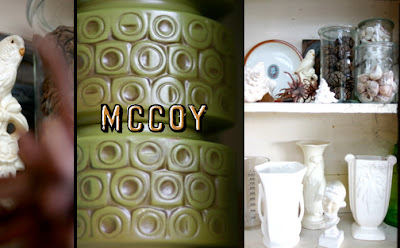 Amy: I've had an on-going fixation with McCoy pottery for years and of late, we seem to be picking up more of their mod 60's and 70's pieces. They have incredible naturalistic textures and colors with an earthy vibe. Honestly they can border on the ugly, but I think that's what makes them interesting too, they're kinda kitchy and fun. I also love the utilitarian quality of vases. I'm always putting out fresh cuts from the garden or from my tropical plants that I over winter in the basement. The gardening never stops in our house so vases are both architecturally beautiful and useful. Here are some shots of our favs. Chris: Hey, thanks for taking the time to help celebrate the anniversary of REFUELED by sharing a little of your creative process and style. Give the cats a hug for me. Peace & Love to you and Dave. Amy: My pleasure Chris! This is fun and you know, I'm one of your biggest fans! Love to you and your sweet family! PS. Here's some sugar for ya from the cats! Julio, Pete & Birdie! "Urban Prairie" Style At It's Best. 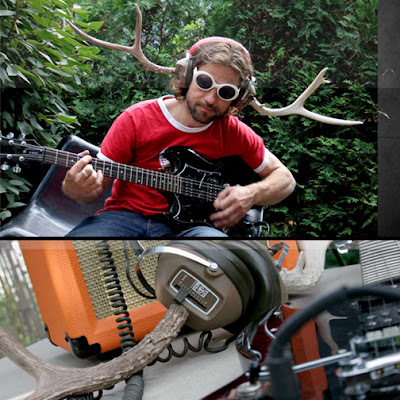 Vintage headphones with real antlers, by CASTOR. NOW AVAILABLE AT URBAN PRAIRIE BLOGSHOP. Add a little humor and edge to your Valentine's day. 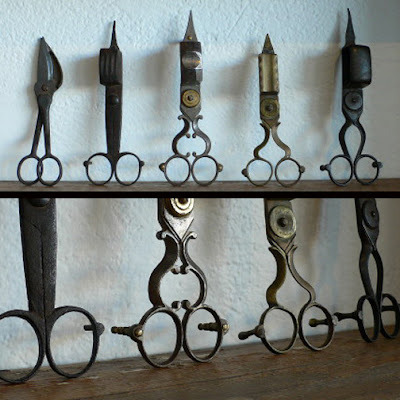 Collection of 18th & 19th C. candle snuffers, from Trove. 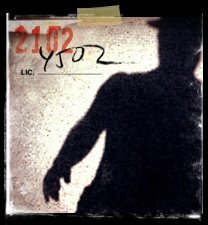 Numbers, notes and odd bits of text continuously show up in my design work - graphic and interior designs alike. 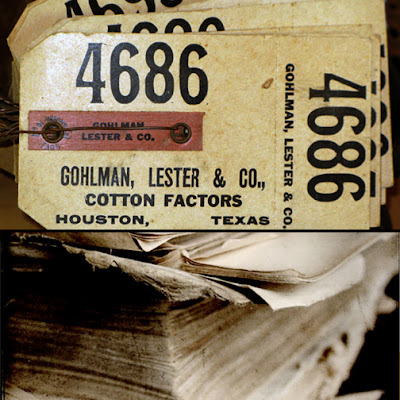 Found vintage journals, ledgers, postcards and handwritten notes in books and bibles have long fascinated me. 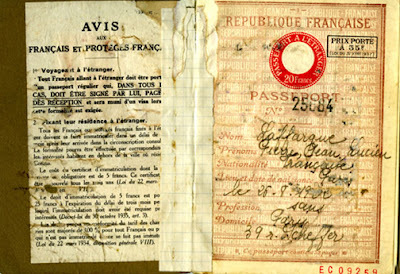 I’ll often save a parking stub, pick up old signs in the street, spot old road maps in small town stores or simply ask to rummage through someone's attic. "You feel like singing a song, and you want others to sing along - just sing what you feel, don't let anyone say it's wrong. And if you're trying to paint a picture, but you're not sure which colors belong - just paint what you feel, don't let anyone say it's wrong." Urban Prairie REFUELED Turns One. 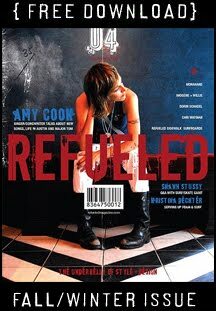 January 11th marks the one year anniversary of my blog REFUELED. I started REFUELED as a place where Urban Prairie fans could go to read banter about oddities, found objects, country design, collecting/collectors and anything else that I found interesting. It was a place I could update frequently. 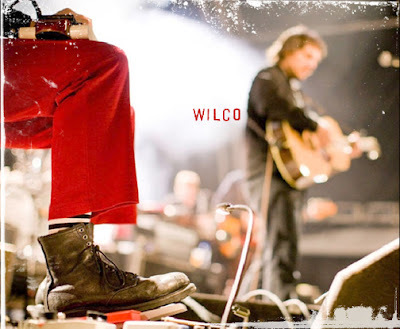 Little did I realize that it would become what it has and generate such a buzz in the alternative country design/collecting arena - for that I thank you. This month will see what I hope you all feel are cool little surprises. Stay tuned. Happy New Year!